Home Match Analysis Premier League 2018/19: Arsenal vs Wolves: Are Arsenal losing momentum? This post originally featured on our comprehensive Arsenal analysis sister site, wearethearsenal.com. A third consecutive draw for the Arsenal found the fans wondering is it just tiredness or the Londoners are getting back to their old habits around Christmas? This time, Wolverhampton Wanderers managed to stumble Unai Emery’s side and the worrying thing is that the team lacked energy and enthusiasm. 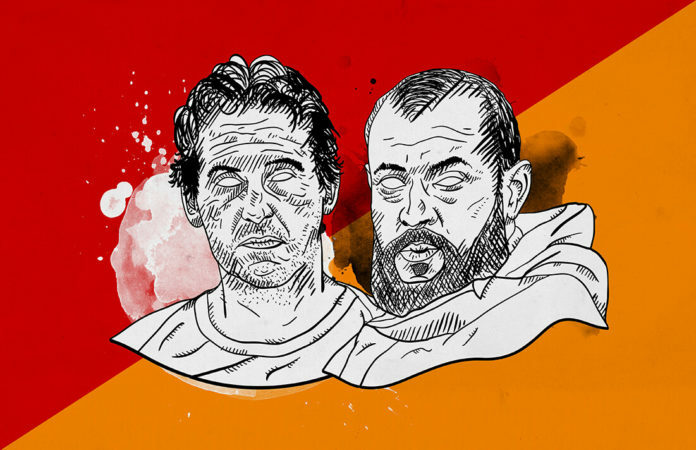 The Wolves manager Nuno Espirito Santos seemed like he had a perfect vision of how he could get the three points out of this game and his players were doing good, but their plans were ruined in the 86th minute. Bernd Leno was undoubtedly the best player for the Gunners and with a lot of support from Lucas Torreira and a late equalizer by Mkhitaryan, the team managed to keep the result 1:1 and keep their unbeaten run in 16 games. But was it all a matter of tiredness or did Nuno manage to outplay Emery, tactically? As you may know, Wolves’ manager Nuno has deservedly been named Manager of the Month for September (with Unai Emery being nominated too). His team just got promoted to the Premier League but are already comfortably sitting in the middle of the table. Wolves started the season pretty solid and had three wins and one draw in the month of September but then it slowly started to fall apart. The team had been defeated in three consecutive games and seemed to have some struggles in the final third and couldn’t take advantage of the opportunities they created. As it happened (in my opinion) against Tottenham, this weekend, Wolverhampton were the better team – tactically and performance-wise. The Arsenal formation wasn’t of surprise (4-2-3-1) and I bet that this is what Nuno was waiting for. His team had mastered the counter-attacks and that is pretty much what defines their performance. And Unai Emery’s preferred scheme did them a favour when it comes to spaces and opportunities to do that. The created spaces formed by Lucas Torreira and Granit Xhaka supporting the full-backs making runs on the flanks were immediately used by the Wanderers and they managed to create some chances. The Wolves ended up with only 29% possession of the ball, but that is actually what the team is good at – wait for their opponents to leave a gap and make a quick turnover. Their 3-4-3 switching to 5-4-1 usually works out perfectly against teams with a highly positioned defensive line where they use these spaces to quickly send them out wide. They managed to form seven counter-attacks against Arsenal and four of them ended with shots. That is what is called “waiting for the right moment.” The total shots they produced was 13 as five of them were on target and two were blocked. That is why you never have to believe to the stats when it comes to possession. Nuno Espirito Santos is a master of the compact play. And I am actually surprised that Emery “the video king” wasn’t prepared for that. Both full-backs didn’t manage to keep an eye on their defensive responsibilities while going forward, especially Kolasinac and then the centre-backs weren’t able to cover them up. Emery’s response to that was changing Alex Iwobi (who is not as useful playing on the right) for Matteo Guendouzi, and later on, making two subs bringing on Mkhitaryan and Ramsey instead of Kolasinac and Ozil. And none of these changes made a huge difference in the team’s performance (except for the goal of course), because the manager couldn’t find the right formation so it could match their opponent’s one. Despite the difference in the total completed passes and the pass accuracy percentage, the Londoners couldn’t take advantage of their opportunities. It is absolutely no excuse for making 27 crosses with only 7% of them accurate. Their opponents dominated in the duels as they won 52 with 18 aerials, compared to 43 and 8. The Wolves were precise enough at the back too making 28 interceptions and 26 clearances – that is a lot of pressure to handle. That is something special about Leno. He is not only showing off his great reflexes, ball handling and decision making, but he is also there to be involved. The German once again showed his drive to help his teammates. He is the reason for the team to be able to build-up from the back. Every once in a while, Leno was looking for a little space between the opponents’ lines and was willing to start an attack on his own by using these gaps to deliver the ball up the pitch. And what I most loved about his performance is that he didn’t stop giving instructions when the back-four was sloppy and unfocused. It seemed to me that he has the same impact on the whole performance as every other player. I picked Jorginho, Kovacic, Fernandinho and Matic. 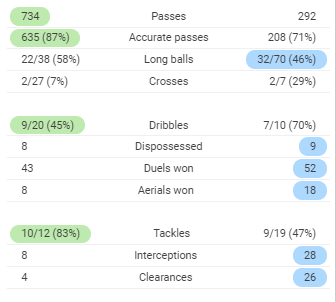 As you could see only Fernandinho has more duels in total (66) than Torreira (60) with the other three not even close to these numbers. But the Uruguayan is the most fouled player – he’s suffered 28 fouls – 14 more than the second in the list Mateo Kovacic. This is proof of how endangered his opponents feel and that there is no other way to stop him than to foul him. Another interesting one is that he is in second place in aerial duels won. I must admit that this surprised me. 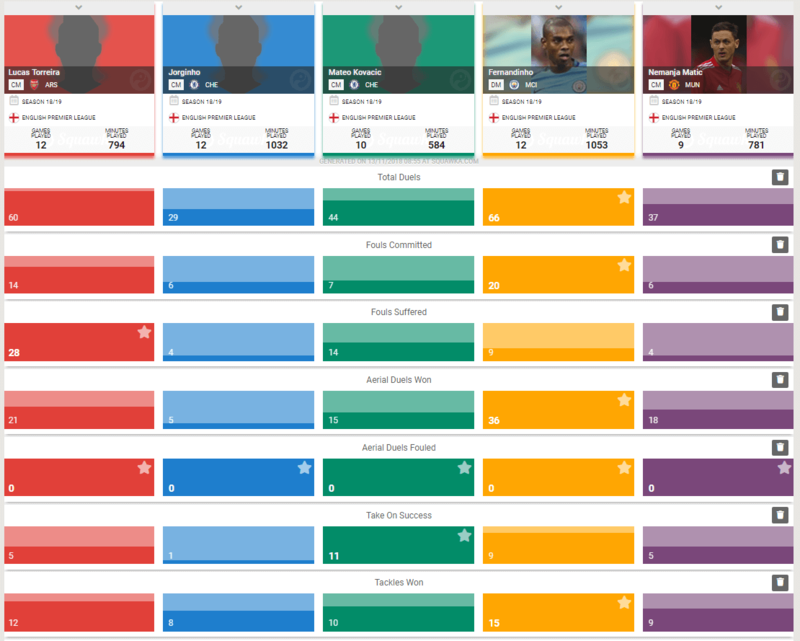 Fernandinho has won 36 and then Lucas – 21, but it is amazing as the Brazilian is 179 cm tall compared to the 166 cm that Torreira is. And then he is second by tackles won – 12 with again only the Manchester City player outscoring him. That is proof that Lucas Torreira is among the best midfielders in the Premier League. The Uruguayan is among the highest rated players in every game for The Arsenal. And so he was against The Wanderers. But the main problem is that he sometimes fights on his own. That is Torreira’s heat map of this game. He made 104 touches on his own and as you could see, he was literally owning the midfield area (without any support). Now look at the right picture – that is the heatmap of Ruben Neves and Joao Moutinho, and their touches combined. Say no more. He had 89% passing accuracy, sent 4/6 accurate long balls, won 6/8 of his duels and made two interceptions and won two tackles. Wolverhampton’s players didn’t manage to dispossess him even once. As dangerous as the Arsenal players are on a counter-attack, this is exactly their Achilles heel when they need to defend against it. Wolves felt comfortable to use their style of play to exploit the spaces left during a defensive transition and it was pretty effective. The Londoners had no response to that high press even after the squad changes and this was going to cost them a lot. The team has to get back on track quickly or they risk falling into the mediocrity and that surely will cost them a defeat or two.